My husband and I grew up watching Jacques Cousteau nature specials, and we sometimes like to imitate him in our bad French accents when we talk about the “elusive and dangereuse” wild animals on the farm. This month I finally figured out a bird that has been eluding my powers of identification for years. Every year I would notice it, get a few blurry pictures, and file them away in a “mystery bird” folder. 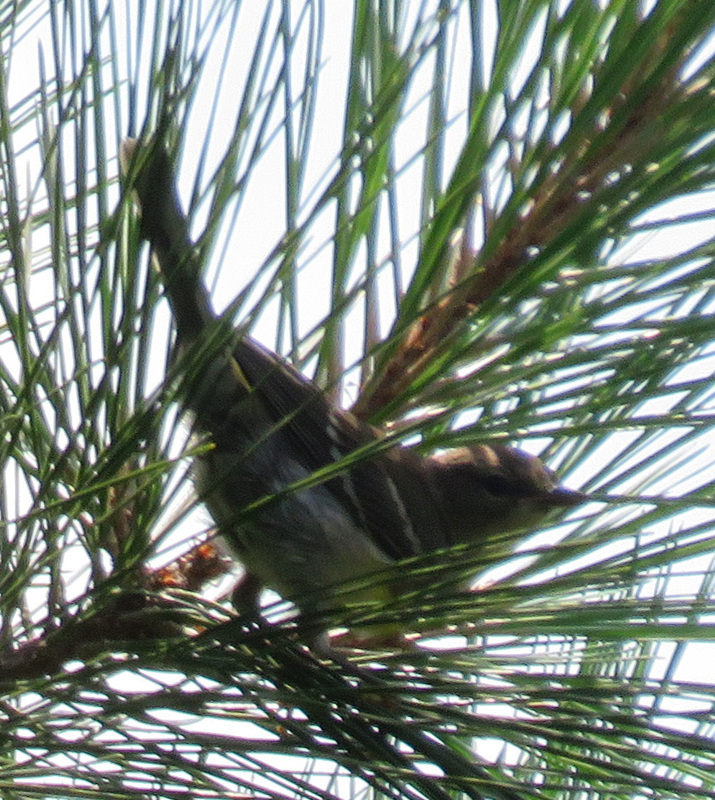 Most of the pictures looked like this, a bird lost in the pine needles. Even when I could get a good clear shot, I couldn’t figure out what bird it was; it seemed to have an unusual stance. It looked like a young robin, but the color was wrong and it was too small. Then recently I was outside one morning painting fabric, and some birds were chasing each other very close to me. They looked like female Northern Cardinals but I don’t usually see those chasing each other, so I took a closer look. One perched out in the open and studied me too. Here is an example of a little knowledge being a dangerous thing. I know that birds are grouped into families, and usually they share characteristics with their family members. 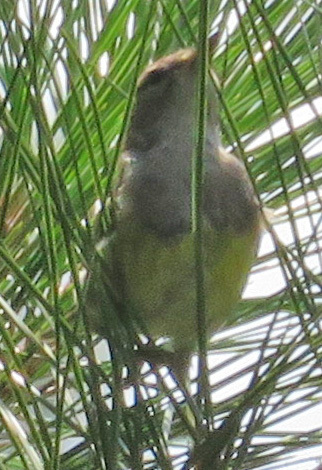 So every time I saw this bird, it seemed to me that it belonged in the warbler family, and that is the only place I looked for it in bird books. 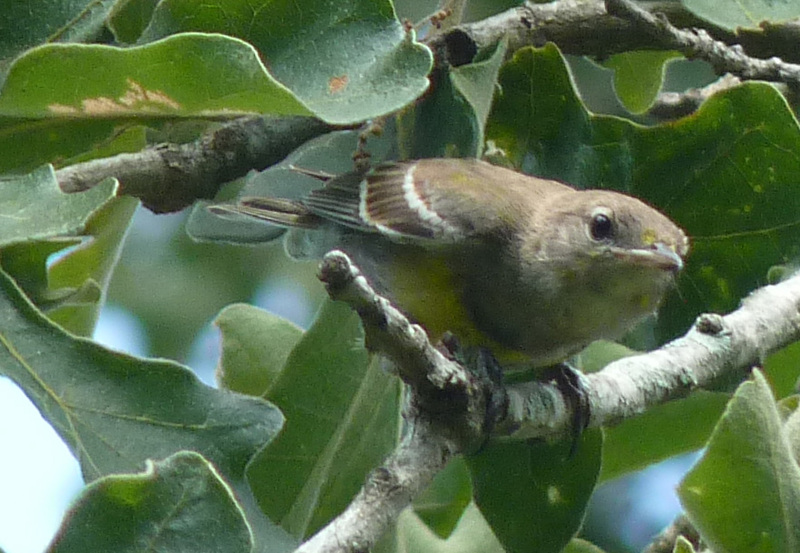 I looked at females, juveniles, birds in first year plumage, but could never find one that had this combination of yellow “vest”, brownish head with weak eye rings, and shoulder bars. 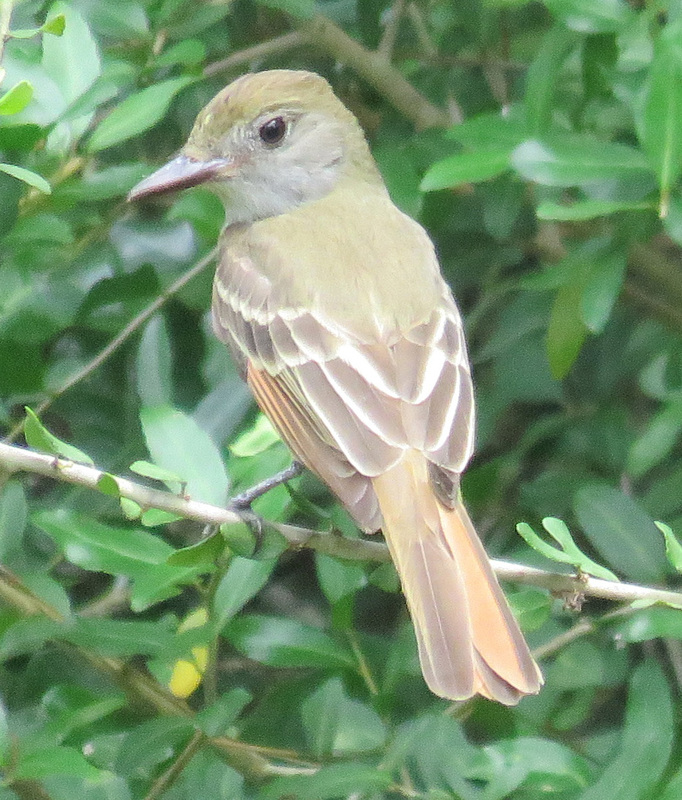 Finally I looked in the other sections of the guidebook and found it — a Great Crested Flycatcher! If I was just a beginning birder, and went through all the pictures page by page, I might have identified it earlier. Finally showing a profile and upright stance. The brownish wings and tail, and the pink base to the bill, are important characteristics in the ID. We have several other members of the flycatcher family here — Scissor-tailed Flycatchers, Eastern Phoebe, Eastern Wood Pee-wee, and Eastern Kingbird. I would not have thought we would have room for one more! 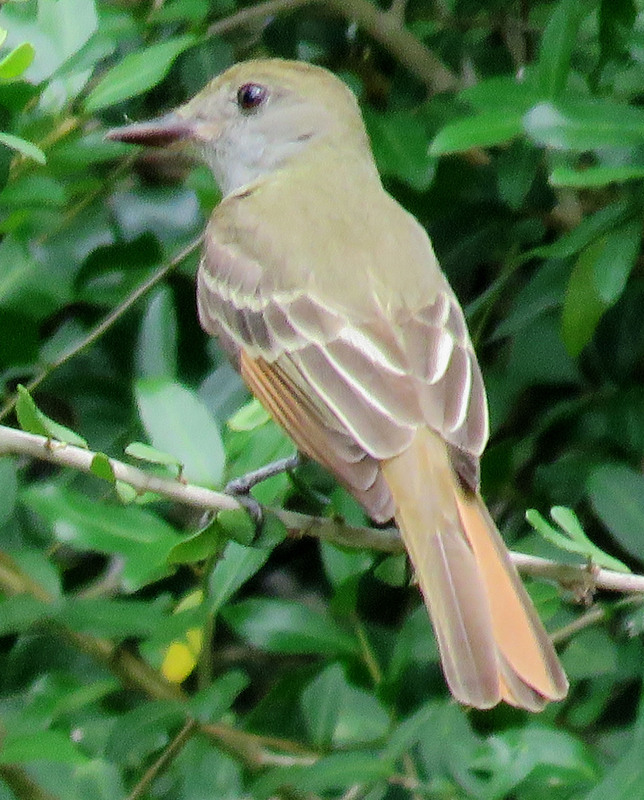 Now I am not certain that the earlier mystery birds were Great Crested Flycatchers, and if an expert were to correct me on this one, I would not be upset. 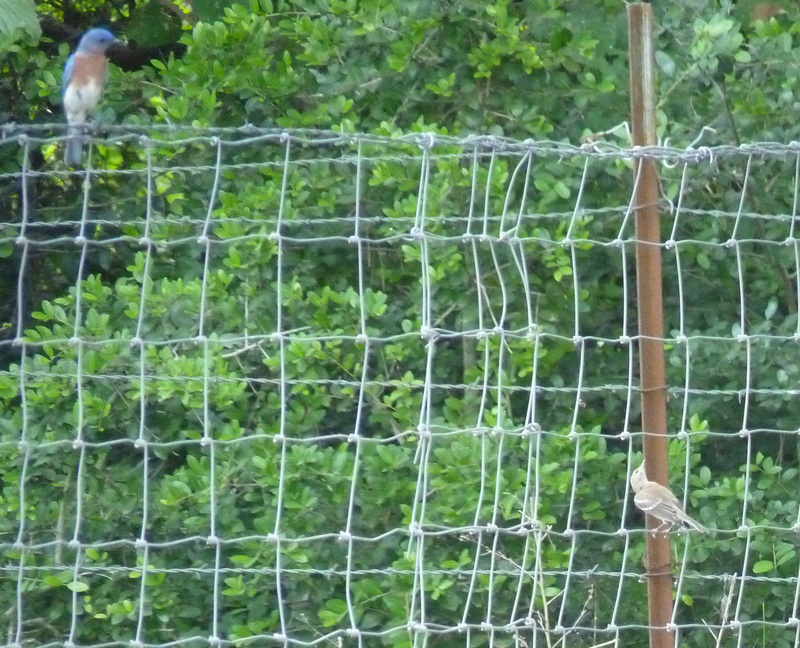 But at least I think I am in the right bird family this time, and this is the 90th species of bird to visit our farm! I love the birds who share the world with us. This is a great story in identification! Sometimes the identification is as complicated as finding the bird in the first place. And I am with you in enjoying the birds — especially when they are new to me, spotting them is a treat. Sometimes it takes me years to figure it out! But I would be interested to see them!